Hundreds and thousands of ball players strive to score 500 home runs during the course of their career, but only the elite manage to make a strong statement. The milestone does not reward players with any specific awards. Instead, it is one of the achievements that have the potential to see a player inducted into the MLB Hall of Fame. 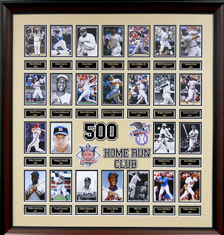 As the years pass, the achievement of this goal has become increasingly significant, and players’ memorabilia shows are usually advertised for and conducted using their ‘500 Home Run Club’ member status. Scorers of 500 home runs form part of a truly elite group of strong sluggers that all ball players dream of entering, but only a few belong to. Here, we will look at all those legendary sluggers who have dedicated their careers to reaching one of the most prestigious landmarks in the sport. On 13 September 1971, Frank Robinson of the Baltimore Orioles became the eleventh players to reach the milestone of 500 home runs. In a career spanning twenty years from 1956 to 1976, Robinson represented teams in Cincinnati, Los Angeles, Cleveland, California, and Baltimore, and scored a total of 586 runs, making him the highest scorer in the 500 club. Having spent his entire career at Oakland St. Louis, McGwire reached the 500 home run landmark on 5 August 1999, making him the fastest slugger to reach 500 runs in baseball history. On 8 August 1971, Harmon Killebrew of the Minnesota Twins entered the 500 Home Runs Club. His career total added up to 573 runs over the 21 years in which he also played for Washington, and Kansas City. On 11 May 2003, Palmeiro joined the list of 500 home run getters when playing for the Texas Rangers, against the Cleveland Indians. He also featured for Chicago and Baltimore during his nineteen-year career, and scored a total of 569 runs. The California Angels may have received a 10-1 battering at the hands of Kansas City Royals on 17 September 1984, but the day will be remembered for Jackson’s 500th home run. Having played for Oakland, New York, and Baltimore as well, Reggie notched up 563 runs between 1967 and 1987. It was 31 May 2008 when Ramirez put his slump to bed, and finally crossed the 500 home run barrier when playing for the LA Dodgers. Prior to the game, he had played 34 games and scored just three runs! Other players who have scored more than 500 runs in Baseball History include Eddie Murray (504), Gary Sheffield (509), Mel Ott (511), Ernie Banks and Eddie Mathews (both 512), Ted Williams, Frank Thomas, and Willie McCovey (all 521), Jamie Foxx (534), Mickey Mantle (536), and Mike Schmidt (548). Babe Ruth was the first player to have reached the milestone on 11 August 1929. Alex Rodriguez became the youngest player to score 500 career home runs, when he entered the club eight days past his 32nd birthday.